Some activities can feel as necessary to who we are as breathing. Things we do for replenishment, things which require engagement of the whole self (the antithesis of multitasking). I remember some years ago when a colleague had time off work for depression. He said that one of the most distressing symptoms was his inability to read any more. I exclaimed with horror but then remembered a time as a teenager when an operation left me temporarily unable to read more than a page at a time. This was experienced as an extreme deprivation. After a bereavement or shock of some kind people can find that the kind of concentration required by reading or listening to music or writing can desert them (this is almost always temporary but nevertheless can be a further loss at a time when normal sustenance is most needed). Can you remember a time when your normal concentration was disturbed and your normal sustaining mechanisms became unavailable to you? What are your activities of deep concentration? The converse can also be true – reading as a means of escaping the real world, for example (if I find myself reading a novel a day I know I need to get out more). But reading was my first experience of deep concentration – for myself and those around me. Reading addiction (hyperlexia or bibliophilia) is of course something else! 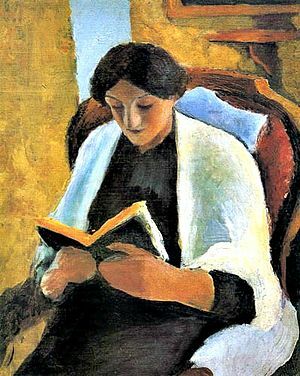 Journal Prompt: Remember a time when you observed someone reading or engaged in another form of deep concentration (eg listening to or playing music, painting, thinking). Describe the body posture, facial expression. What did you hear? What did you feel? What was the atmosphere like? Carolyn, it seems that trauma really does disrupt the ability to concentrate – at a neurobiological level in the brain. I wonder if you find the type of book needed for immersion changes depending on external challenges? Jenny, finding silence can be quite a challenge in this world – so all the more to be enjoyed when you have it. Do you have favourite ways of finding silence? Nothing beats being having perfect peace to be able to completely immerse myself in a book. But I think you have raised a very interesting point for me in that it is so harder to do if I am going through a challenging time. Thought-provoking! I like reading, walking and other stuff, but the place I go for replenishment is into my own thoughts, and that requires inactivity and silence. The times when I’ve felt cut off from my source of joy have always been when there’s too much noise and business around me, that I can’t escape from. My hell would be neighbours who played loud music – that, I think, could drive me mad.